In my travels around Japan, I sometimes come across richly talented artists who are little known but whose work stand out from the crowd. One such gifted potter is Kikuchi Yuka, who makes beautiful and functional works with black inlay (zougan) and blue-and-white (sometsuke) porcelain. 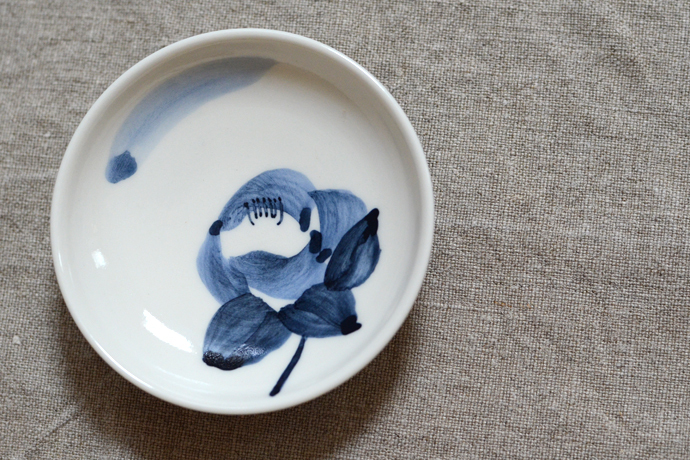 Yuka shines because of her exceptional ability to produce forms that marry contemporary elegance with simplicity and tradition, and in portraying nature through stylized patterns in her blue-and-white porcelain. What adds to Yuka’s talent was the experience that she gained from learning from one of Japan’s great Kyoto sometsuke masters, Kondo Hiroshi. Kondo was an internationally famous potter and an avid teacher who took her along on his workshops overseas. Yuka spent seven years studying under Kondo and she was his last apprentice before his death in 2012. While Yuka learnt a great deal, it was also a humbling experience and she initially found it difficult to escape her master’s shadow. “For a long time I was bound by my self-inflicted pressure not to disappoint my teacher”, she said. But with Kondo’s passing, Yuka has finally begun to find her own way, which is allowing her to produce work with style and vigor. “I now think that I should simply make the best pots that I can make”, she said. Yuka’s zougan works are simple but uniquely elegant vessels. “I design my work to compliment the food, so its presence is felt but does not overwhelm“, she explains. Her sometsuke work, which she only started making recently, is a display of exceptional skill in brush techniques and stylized expressions through shades of blue. It is a fitting homage to her late teacher. 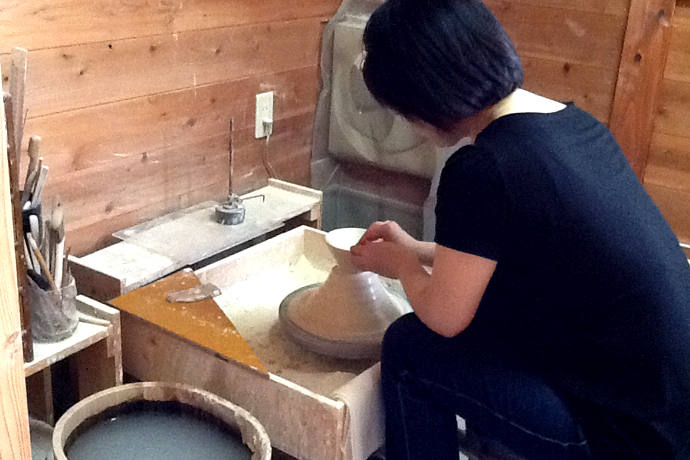 Yuka makes her wares by throwing clay on the wheel, which is trimmed down to the shape she requires. She alters the clay’s hardness depending on the size of the piece that she throws. The size and shape of each pot is determined carefully for its usability. But she says it is difficult to control the shape because when the piece dries, the clay often warps to the way that it was thrown, almost like it has a memory. 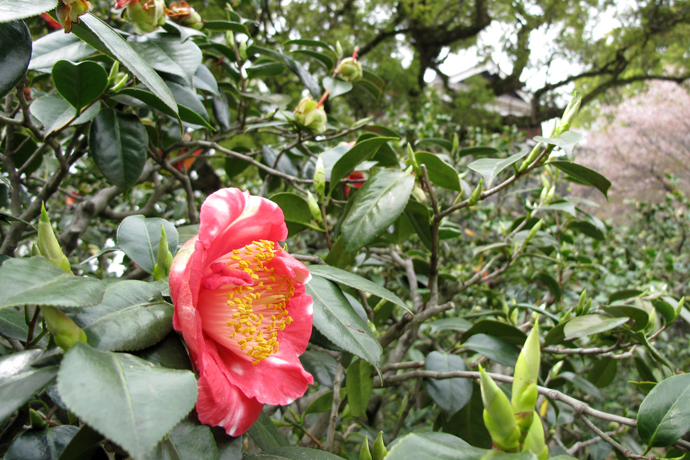 Higo camellia is the pride and symbol of Kumamoto, a prefecture often overlooked in Japan. One reason why Yuka is little known is that her studio and house, Ennyo-gama, is located in the distant village of Minamiaso about 25 miles east of Kumamoto in Kyushu Island. It is on the volcanic caldera of Mt. Aso and is famous for its healing hotsprings. I had the opportunity to meet Yuka at her studio this past spring when I traveled to Kumamoto with a pottery tour group organized by Bill Geisinger and Ben Horiuchi. All of Yuka’s work is made using porcelain that comes from the Amakusa Islands, which are just off the coast from Kumamoto. Amakusa porcelain is famous for its pure white color, durability, plasticity and minimal shrinkage and slumping when fired. 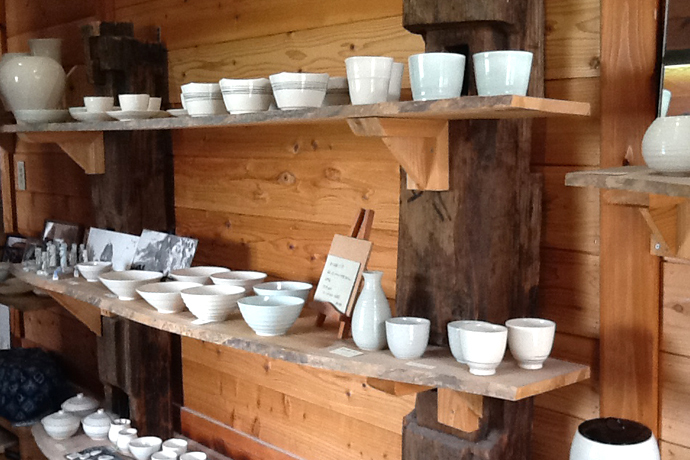 While Amakusa supplies as much as 80 percent of the Kaolin used for porcelain clay production in Japan, porcelain pottery made in Kumamoto is not well known. 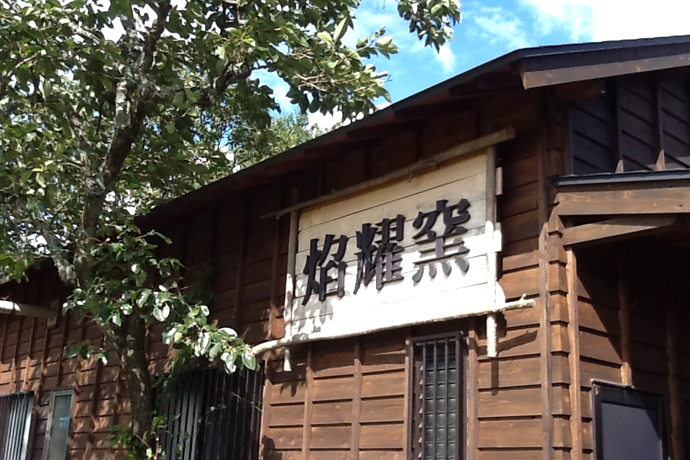 Kikuchi Yuka’s showroom in Minamiaso, Kumamoto. 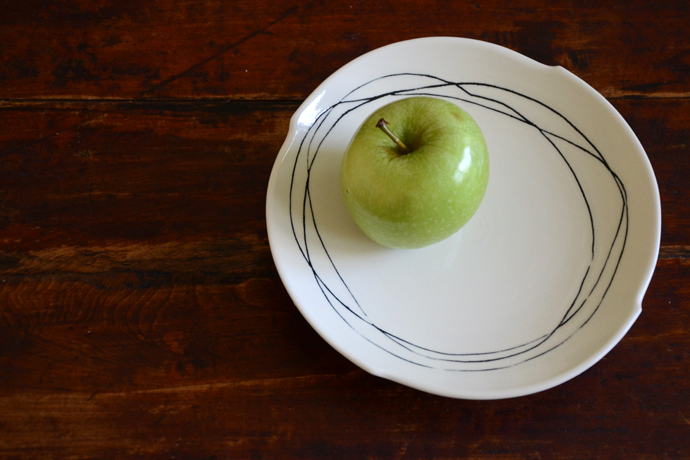 All of her work is made using local porcelain from Amakusa. Yuka said that when she announced in 2008 that she was ending her apprenticeship in Kyoto and moving home to open a studio in Kumamoto, “almost everyone around me asked if there was any pottery there”. Yuka pointed out that while “Kumamoto is best known as the raw material provider and agricultural center of Japan, there is a lot more happening here.” She hopes that her work will help people recognize Kumamoto for its culture, history and tradition, an accolade that it very much deserves. We at Studio Kotokoto will certainly be paying attention to Yuka and Kumamoto as we enjoy the creative elegance and flair that she brings to porcelain pottery.